Sean O’Meara (Senior captain), John Fenton (Midleton CBS Secondary School Past Pupils Union), Pat Hurley (former Principal and current member of the Past Pupils Union) and Isaak Walsh (U14 captain). CBS Secondary School Midleton paid homage to its two victorious hurling teams this past Tuesday, 23 May. 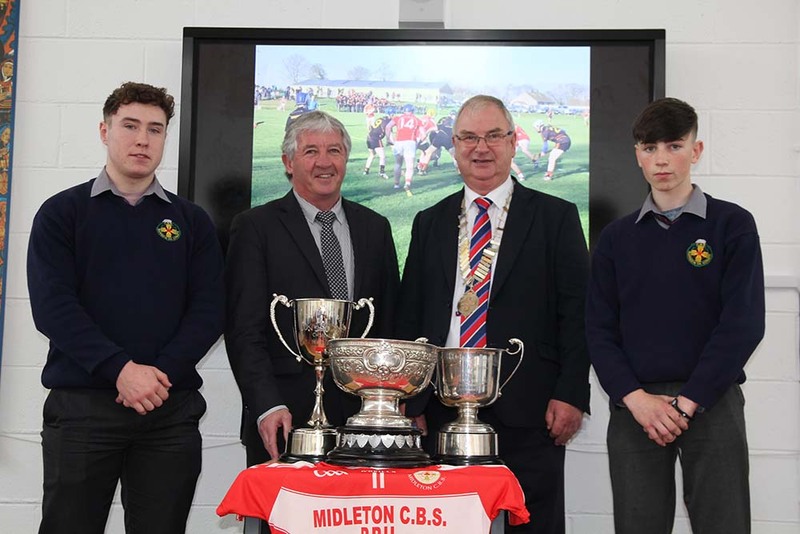 The CBS Secondary School’s Under-14A and Senior hurling teams were each victorious in their respective finals with the Seniors defeating St Coleman’s Fermoy by a score 4-12 to 1-18 in the Lord Mayor’s Cup A Final on Friday, 12 May, while the U14As thrashed Gaelscolaiste AG by a score of 6-23 to 0-2 last Thursday, 18 May. This past Tuesday the players from both teams were presented with their medals by the school’s own alumni and former Cork hurler John Fenton following speeches from Aylwin Kearney and Tim Collins of the Senior management setup. Mr Fenton, who was chosen to make the presentations based on his record as a player, his involvement with the Past Pupils Union and his continued interest in the team’s welfare and success, also delivered a speech. Mr Fintan explained that simultaneous academic and sporting success was achievable for the students and wished the senior teams the best going forward with their exams. Turning to the U14 teams, Mr Fintan encouraged them to match or beat their senior counterparts, telling the students “If you think it is possible then it is possible”. Isaak Walsh (U14 captain) and Sean O’Meara (Senior captain) were then presented with their teams respective trophies.